It's difficult to know where to begin a review of Depo, one of West End's coolest cafe / restaurants, except to say that if it's cool by West End standards, we're talking seriously cool. When I sat down to write I also had to search my mind, and eventually my thesaurus, for synonyms for that much over-used word, 'quirky'. Watch out for them; this is the kind of place that requires me to sprinkle them liberally throughout my review. 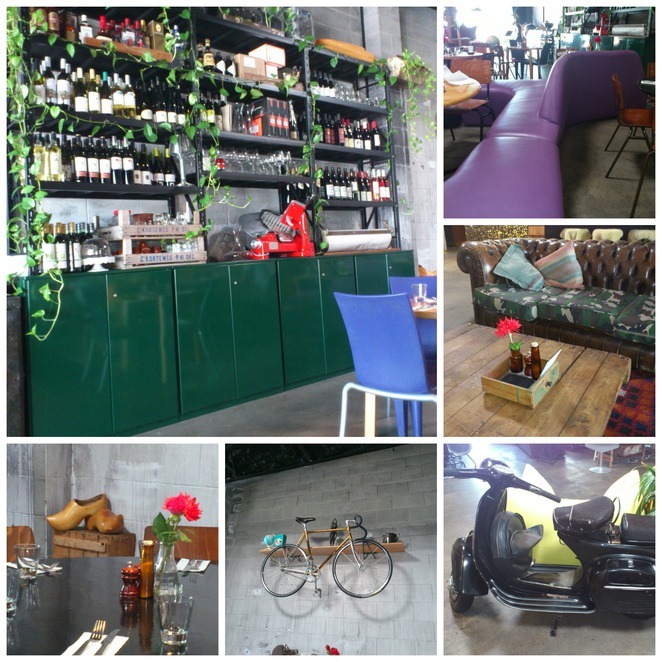 [ADVERT]My son had heard about Depo and thought that my interior designer daughter and I might like it, purely because of the mixture of original design elements that pervade this large, former factory space. After all, Depo is owned and designed by Alexander Lotersztain, who also counts Limes Hotel and Alfred and Constance amongst his design achievements. The food was only ever going to be a secondary consideration. We found Depo, thanks to our reliable GPS, in an unlikely industrial and commercial area opposite West End State School. 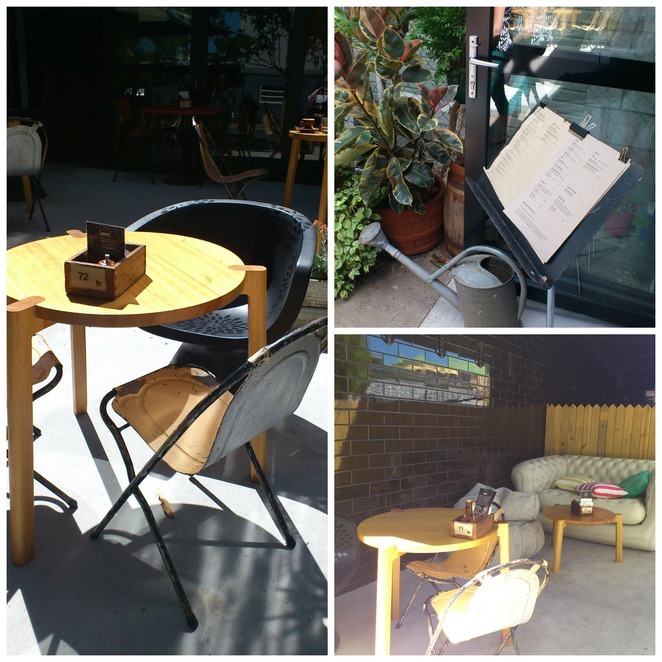 We were impressed with the glossy, black tiled exterior with mix 'n' match outdoor seating. At the door we were greeted by a peculiar doorman (more of that later), an old sheet music stand displaying the menu and a watering can, presumably in case we got the urge to water the myriad of plants just outside the door while we were waiting for our meals. It was a very bright, sunny day when we visited and it took a while for our eyes to adjust to the lower interior light, which was probably a good thing; we weren't hit with the gazillion zany elements all at once. When our eyes did adjust it was hard to know where to look first. Purple sinuous seating screamed "Look at me!" beside a studded leather Chesterfield sofa with camouflage-print cushions. Old wooden Nordic skis occupied a quiet corner opposite one with wooden clogs. A large industrial shelving unit entwined with ivy sat proudly against the besser block wall, doing double duty as a wine rack and display for vintage urban artefacts. A bike hung nonchalantly on the wall and a motor scooter was parked casually in the middle of the polished concrete floor; where else? And a disco ball was suspended high above the riotous jumble of it all. There was a TV showing a fireworks display on high rotation and I wondered why, when the restaurant has one of the most mesmeric, while-away-the-time features I've ever seen - way better than a fish tank. Remember Glomesh, ladies? Wallets and evening bags resplendent with shiny gold interlocking discs. Well, Depo has its own version; an entire wall covered with what looks like Glomesh on steroids. The large reflective discs rippled and shimmered as the breeze moved lightly through the large, open space. What a show! If you're getting impatient you'll be pleased to know that I am going to talk about the food, because even in the midst of all this outrageous ornamentation, it deserves to be talked about. My Spanish omelette with chorizo, potato and spring onions, was smoky, a little bit spicy, and totally satisfying. Served with crunchy, toasted sourdough bread it was a great late breakfast. And while my meal was very good, my daughter's spinach wholemeal pancakes with smoked salmon and a poached egg were a standout. It was a stack of light, fluffy pancakes, sandwiched with melt-in-your-mouth smoked salmon, drizzled with lemon and dill yoghurt, and sitting on a bed of baby spinach leaves. Delicious, and surely enough to raise the food to equal billing with the decor. There are some unique 'creature features' throughout Depo that really must be mentioned but could prove unsettling for those with an over-active imagination. You've been warned; if you don't enjoy the feeling that someone, or something, is watching you then perhaps Depo is not the place for you. The doorman I mentioned previously? You can't miss the antelope sentinel (at least, I think it's an antelope). I suspect he's employed as the bouncer after dark. Don't let that jaunty saddle blanket fool you; with horns like that it would be a mistake to get on his bad side. If you're sitting at the large timber table you may feel uneasy if you look up suddenly to see the glassy eyes of the water buffalo, complete with barbershop quartet hair-do, gazing down suspiciously from the bleached timber-patterned wallpaper. Water buffalo - escapee from a barbershop quartet? But by far the most disconcerting of all is the improbable gold piglet that casts a propietary eye over the cafe from his perch atop the bar. There's something disturbingly kitsch and Liberace about that furry toupee and gold lamé. The 'Liberace' pig. Just another ham or something more sinister? Design-wise I found Depo to be a bit Alice in Wonderland, really. I love the fact that you can play with unorthodox design in a restaurant space in a way that you could never do in a home you live in. But I had the feeling we had wandered whimsically past 'quirky' into the realms of 'weird' and 'bizarre', and I wouldn't have been at all surprised if the Queens of Hearts had appeared shouting, "Off with their heads!". Maybe Depo is just one of those 'impossible things' that she sometimes believed before breakfast. Depo is open Wednesday to Sunday from 7am until late. You can pop in for breakfast, coffee or lunch or enjoy the seasonally inspired dinner menu. We'll be going back to savour what's on offer at their innovative Leftover Sundays, where from 4pm you can enjoy a limited selection of the past week's menu for reduced prices, along with cheap cocktails. The place probably takes on a whole new vibe in the mellow afternoon sunshine. But I'll definitely be keeping my eye on that pig. When: Open Wednesday to Sunday from 7am until late. It's not quirky. Just another retro cafe like all the rest.